There are two interesting things about Irwin’s “National Tradesman Day” slated for the 16th of this month. The first is the obvious declaration of a national “day” that, sadly, will mostly only be observed by Irwin. The other is the fact that we even need a Tradesman day. But before you work up a righteous indignation, let me explain. The U.S. was built, in large part, by the hands of our tradesmen and workers. These are professions that keep us operating and keep our quality of life better than it’s ever been on a day-to-day basis. From the house you live in to the road you drive on, these hard-working people make all of that possible. In the last generation or so professions like plumber, electrician, HVAC, carpenter, mechanic, and general contractor have fallen out of vogue. For many parents today it’s four years of college (or more) for their child and a white-collar job, or your kid is considered some kind of failure. Trade skills are not equivalent to ditch digging. These aren’t fallback jobs that need to be considered only because “The world needs (insert tradesman job here) too.” They are noble professions that are vital to our continued functionality. For anyone who doesn’t think so, try going without power or water or your vehicle for a little while and see how long you make it. Your Facebook page will seem less important after a day or two, I promise. It’s rather annoying that as a country we have “progressed” so far that the knowledge and professionalism required to be a quality tradesmen requires a day to recognize and bring awareness to something that should be readily apparent to anyone willing to look. Irwin’s recognition on the 16th is of course a shade self-serving, as these are their customers and Irwin exists largely to supply tools to these individuals. Then again, who the hell else, other than Mike Rowe, puts the spotlight on our tradesmen? As you mentioned, nobody but Irwin will really notice. Hmmm…Hallmark Cards may be missing an opportunity. Seriously though, it amazes me how so many people look down on tradespeople. “Him?”….”Oh, he’s just the (trade).” Those words are spoken thousands of times a day. Many years back I was licensed in several trades – couldn’t decide, I guess -and went to work as a “maintenance engineer” for a major hotel. Once the backlog was caught up, I became “maintenance” which began to turn towards a janitorial job. Nothing wrong with a janitorial job if one is a janitor by trade. Needless to say, I moved on quickly. I hear similar stories for many skilled people in the “maintenance” trade. Hooray for Irwin, anyway! our company contracted “ditch digging” out to a variety of other concerns. the thing you quickly discovered was that digging a good hole required a very special skill set. square sides were a wonder, flat bottoms a delight and spoil thrown far enough back that it didn’t rain down your collar a miracle. i guess my point is all the “trades” have their own magic, not easily mastered by all of us. What a lot of white collar people don’t realize is that unless you are a manager is that they too are tradesmen just using a different set of tools and that we are well on the way to regarding many of them (especially the computer service variety) as “simple tradesmen”. I see this every day and it sickens me. I respect good tradesmen because god knows I don’t have the skills of a master electrician or plumber just like many of them can’t/won’t diagnose and repair their computers. But part of the reason that many people view tradesmen that way is because of the bad ones … I had a plumber that was supposed to pull out my bath room and put it back together after foundation problems… they completely screwed it up and now I cant use it. Irwin, the company that has moved production of many great tools to China, Vise Grips for example. Over the years of working both commercial, and residential construction, as a carpenter, I have worked closely with skilled individuals in almost every trade associated with the building process. I have never failed to marvel at some of the solutions to problems that can come from a collaboration of these folks, often things that would boggle the minds of the un-initiated. I actually left the world of management, and pursued the carpenter path because I enjoyed the work, and it followed a tradition , since my grand fathers, and great grandfathers, were all involved in the carpentry trade in one way, or another. Now some 30 years later,and a contractor in my own right, I have absolutely no regrets about my career choice, and am proud of my profession, as well as admiring of the other trades. My father, who was an executive, always instilled in me that all men should be respected for the work they do, if they do it well, I wish there were more with his attitude these days. He can fix what we break. He can make what we need. Apologies to Mike Reid if I got this wrong. I’m working from memory here! I just can’t seem to get all warm and fuzzy over Irwin, part of a glorified Tupperware company that screwed DeWitt, Nebraska over royally, and would do the same in a heartbeat to all those American tradesmen they’re so “dedicated” to. I don’t know that we really need a ‘National Tradesman Day” but I think we could use to be a little more respectful of our tradesmen. 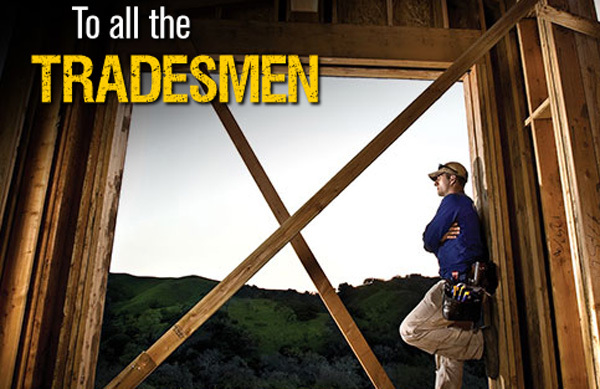 Tradesmen in general are some of the most versatile and useful people in our economy. In the old days, a tradesman was called a ‘mechanic’ and I think that is more appropriate because most tradesmen are naturally more mechanically inclined than, say someone who sits at a computer all day droning on the same couple software programs. I always think of it in an extreme (post apocalyptic) scenario…. would you rather be accompanied by a mechanic/carpenter/tradesman or an accountant? Sadly, the downside to being a tradesman (and possibly the reason for such a shortage of tradesmen) is that it’s a low pay and physically demanding job. Please respect your local tradesman – not just on the 16th but everyday. I went to trade school (automechanic) and college (Industrial engineering) and what I can tell you is that I used my trade more than my engineering degree. 15 years after college, I finally got a job requiring an engineering degree (Environmental Specialist) Over the years, I have saved thousands of dollar working on my cars and other people cars. I saved so much money that it paid for my college loans. I would advised all young people to take up a trade and go on to college. P.S. You can take up a trade in college. I also received a welding certification from college. As a white-collar engineering professional myself, I thoroughly enjoy the occasional “wrench-time” during the work week. It takes all kinds of folks to make the world go ’round, but tradesmen really get shorted these days. Great post. @jeff_williams – agreed, that TED talk by Mike Rowe is really great! Yeah, I gotta go with the other guys. Irwin can spend the cash they saved closing factories any way they want but I’m telling you blue-collar flag-waving isn’t going to be one of them. Beyond that I think more importantly the people who produce that the people who trade. With all due respect, I think that more will have more white collars, and will need more immigrants to use the blue collars. The borders tend to be increasingly less important, and every day work using tools from China, India or Mexico. And when you get home look at your flag waving in a movie filmed in New Zealand, on a TV made ​​in Vietnam. Unfortunately or fortunately, everything changes. Juan, yes you are ultimately correct. Sorry, Irwin. I don’t fool that easy. When your president writes, “To work with one’s hands—to build something—always has been and always should be commendable. Today, we make it official. Thank you, America’s Tradesmen!”, he is being a hypocrite. The company took jobs away from Americans that were willing to work with their hands and build Irwin tools, so where is the thanks to the American factory worker that is so closely aligned with the trademan? I know it is a “global economy”, but when I have the choice of buying an Irwin made in China or another brand that is made in the USA, I’ll show my thanks the American worker by helping them keep their job. No really, I say that to people… often. just another empty gesture from an American in name only company. Happy offshore communist slave labor day Irwin. Regardless of who came up with it I think it’s a great idea. I’m not a tradesman, although I admire and appreciate work done well, be it physical, intellectual or any combination of the two! He was one of those guys from the “greatest generation”, that truly respected the janitor, as much as the next Vip that walked in the room, and in many cases, much more. I am getting so tired of hearing about China. The fact is, Americans making cars, tools, etc.. in the U.S. are not worth what they are paid. Also, the average American does not lead the world anymore. They are paid too much, uneducated, and unmotivated to work. I don’t care where they make my tools. If you can make a tool overseas, and pack and ship it here and still win… well guess what… you are paying too much. While I agree that buying American made products is great, it is almost becoming difficult to do. As I sit hear and look at the DeWalt ads the left and right, I wonder how many people who are complaining about Irwin making tools outside the US are holding their DeWalt, Makita, Milwaukee, Bosch power tool in their hands. The reality is, while we would all like to buy American made product, when you look at a wall and see two similar products, and one is a few bucks less, the average person will not turn the package around to see where the product is made, instead they will reach for the less expensive option and head to the register. I try to buy good tools from good brands. I own Irwin, DeWalt, Milwaukee, etc and if they do the job, I am happy. Ulitimately, I feel like the profits are coming back to the US and that helps our economy run.